A loyal Volvo customer for over 35 years, Laurencekirk-based, Douglas Mitchell has recently added a new FH13.540 tractor unit to its fleet. It has been supplied by Volvo Truck and Bus Centre North & Scotland in Aberdeen. 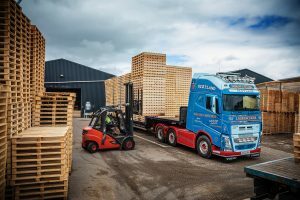 The new 6×2 pusher axle tractor comes with a Globetrotter XL Cab and a 4,100mm wheelbase chassis and is powered by Volvo’s D13K engine producing 540hp, and inside the cab is a leather interior and a single bunk, along with a coffee maker and microwave oven. The vehicle also benefits from a five-year, Volvo Gold Service Contract. Douglas Mitchell will use its latest FH to haul a variety of trailer types, on transport predominately linked to the agricultural industry. To provide maximum fleet utilisation, SB Components also fitted tipping hydraulics, in addition to chassis side skirts, chassis lockers and a catwalk to the truck. Alcoa Dura-Bright alloy wheels and super single tyres on the front axle are also included in the firm’s preferred specification. The new arrival is also the most powerful FH to date within this fleet, with the remainder being 460, 480 and 500hp examples. The Laurencekirk operation’s traditional Scottish fleet livery includes high presentation standards and a factory-painted solid Blue Regatta coloured cab sports additional paintwork and sign writing by Alan Dougan of Auchterarder. The Mitchell family’s association with Volvo stretches back to 1983, when Douglas bought an F7. Since then a variety of tractor units and rigids, have been operated including F10, F12 and FL10s.